(Faithful photographic reproduction of a two-dimensional, public domain work of art. Original in the Museum of London.) 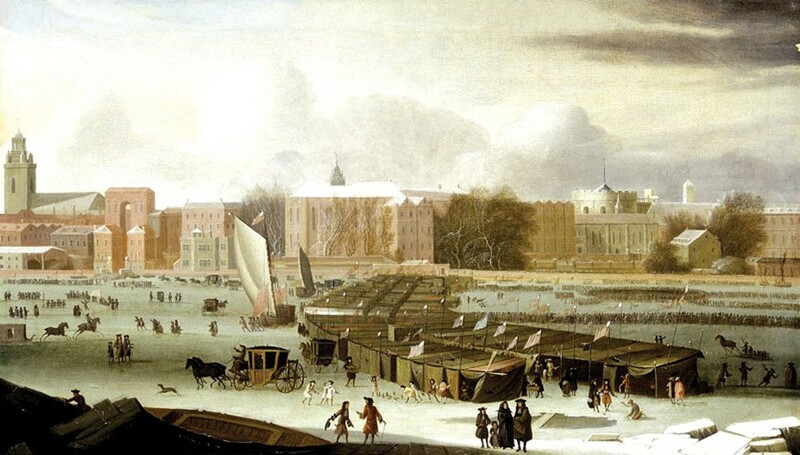 The Frozen Thames 1677 by Abraham Hondius. A British scientist recently warmed the hearts of climate-change deniers the world over. According to press reports following her presentation to the Royal Astronomical Society's annual meeting in Wales last July, Dr. Valentina Zharkova predicted that a mini Ice Age would begin in 2030. If true, this would make a mockery of decades of meticulous research by thousands of climatologists, who overwhelmingly agree that anthropogenic (man-made) greenhouse gases are causing the Earth to heat up with no end in sight. Truth is, Zharkova, an astrophysicist and professor of mathematics whose expertise is the sun's magnetic field (not earth's climate) said nothing about an impending Ice Age. She and her three colleagues did, however, claim that a "Maunder Minimum" was imminent; that's something else entirely, as we'll see. From an electrical point of view, our star is a dynamo: Convecting fluid deep in its core creates the sun's magnetic field. Nearly 200 years ago, scientists showed that the strength of this field waxes and wanes in roughly 11-year cycles like a slowly beating heart. A period of peak magnetic activity ("solar maximum") causes many sunspots to appear on the sun's surface. Conversely, few or no sunspots are seen at periods of solar minimum. Zharkova proposed that, like the hero of Doctor Who, the sun has not one but two hearts. Exceptionally high magnetic activity (many sunspots) occurs when the hearts are in sync, and vice versa. She claims that the very low sunspot period from 1645 to 1715 known as the "Maunder Minimum" (after solar astronomers Annie and Walter Maunder) resulted from the heartbeats being out of sync during that time, and that we are in for a similar but shorter Maunder Minimum during the decade 2030-2040. The LIA and Maunder Minimum dates don't match. The Little Ice Age began in the 1300s, with a major glacier expansion starting around 1550; the Maunder sunspot Minimum began in 1645. A change in the sun's output would affect the entire planet equally and consistently. While the LIA was a time of exceptionally cold winters in the North Atlantic region, summers were nearly normal and the effect wasn't felt consistently around the globe. The earth has warmed by about 1.3 degrees Celsius since the start of the Industrial Revolution and is on track (at the rate we're burning coal, oil and gas) to rise by another 2 to 4 degrees by 2100. The cooling effect of a lengthy solar minimum would be small fry in comparison, probably no more than 0.3 degrees. Here's the irony: Climate skeptics — who apparently distrust scientific studies — have seized upon a single, modest, and largely irrelevant study to persuade themselves that we're about to enter a mini Ice Age. Meanwhile, hundreds of studies show climate change is both real and unremitting. Sorry, gang. Upcoming Maunder Minimum or not, there's no Ice Age waiting around the corner to save us. Barry Evans (barryevans9@yahoo.com) worries more about chinook in the Klamath today than H. sapiens in 2030.